Nikon Df review: New low light champion? Following a series of TV teaser spots filmed in the Scottish Highlands, the somewhat controversially styled ‘retro’ Nikon Df was finally launched in October. Although the Df is a fully-fledged digital AF camera on the inside, the exterior is reminiscent of the firm’s earlier film-era models of the 70s and 80s. Despite the retro-appearance with the top plate bristling with metal dials and levers, the Df has a 39-point AF system using the Multi-Cam 4800 AF module from the D610 and the 16-Mpix CMOS sensor and image pipeline from the flagship D4. Like that model sensitivity runs from ISO 50 up to 204,800 (extended), but it lacks a pro-oriented high-speed shutter with a maximum speed of 1/4000th sec and 1/200th sec flash sync. Unsurprisingly the Df can’t match the D4’s maximum burst rate either at 5.5 fps but it adopts the same glass pentaprism as that and D800 with a 100-percent coverage and large (0.7x magnification) viewfinder image. It also has a large 3.2-inch high-resolution LCD panel to the rear. Although the Df is a autofocus camera and was launched with a special edition AF-S Nikkor 50mm f1.8 lens, it’s first camera from the firm since the film era F4 to include a folding AI post allowing mounting of the majority of manual focus pre-AI Nikkor lenses from the 60s and 70s. The Df is also the first DSLR in recent times to omit any video features, a bold move from the firm and one that seems at odds with the not inconsequential $2749 asking price for the body. Like those earlier film era cameras the Df is available in black and chrome finishes, and measuring 143.5 x 110 x 66.5 mm and weighing 710g (1.56 lb) it’s the smallest and lightest full-frame model in the firm’s line up. 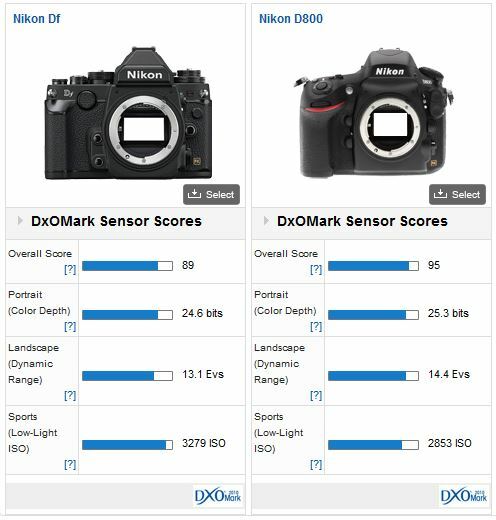 The Nikon Df achieves a DxOMark sensor score of 89 points and is ranked 11th overall but sits in 1st place in our low light scores with an ISO 3,279 rating. It’s only marginally ahead of the D4 and more by luck than judgment it’s ahead of the D3s; though in real world terms the low-light capabilities are the same. The Df is ranked 18th for Color depth matching some older MF models such as the Pentax 645D but just behind the Sony A7R, and comes in 32nd place for DR, just behind the APS-C NEX-6. 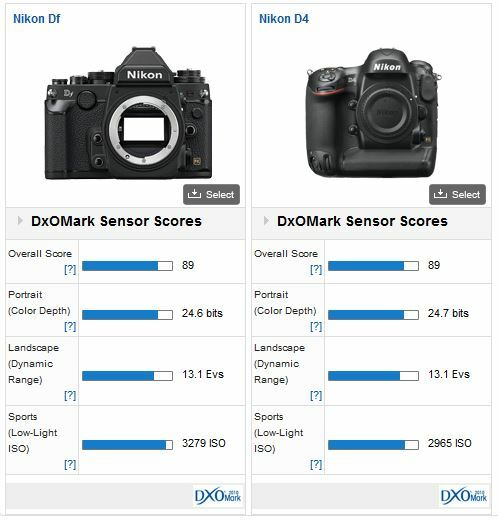 When compared against the firm’s $6,000 press-oriented D4, color depth, dynamic range and low light scores of the new Df are very closely matched indeed, suggesting the sensor is the same unit in both models. 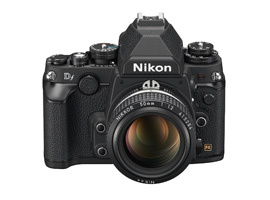 The Nikon D4 is no longer the only choice from the firm for available light. Nikon users have been crying out for a replacement for the D700 but the retro controls of the Df are likely at odds with the majority of those potential customers. 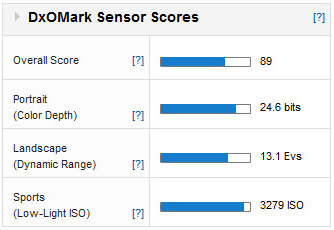 With the Df’s lower DxOMark score the D800 has the potential to offer improved image quality at lower ISO settings. Averaged out it has around a +1/3 stop advantage over the Df. Apart from the advantage in resolution the D800 has a improved color response and a wider dynamic range, though in low-light and higher ISOs the Df can claw back some that lead, particularly with noise and dynamic range where the Df is superior. 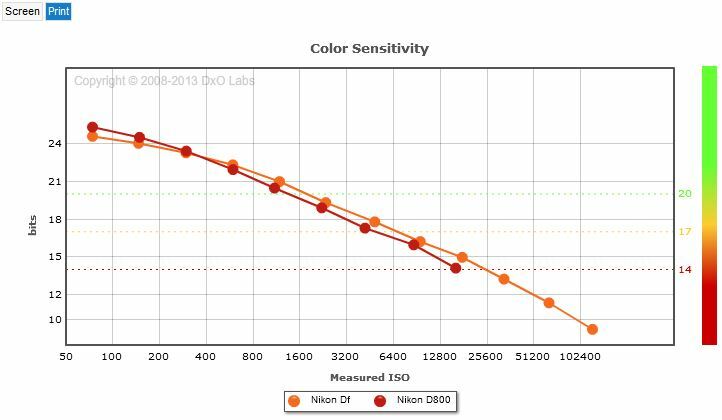 Against the Nikon D800 the Df can’t match the 36-Mpix sensor in color depth at base ISO. The new model has around – ½ stop less from ISO 100 to 200, dropping slightly, to around -1/3 stop behind the D800 from ISO 800 to ISO 25,600. For studio and landscape, the D800 would be the better choice, though in reality there’s not much in it. Bear in mind the Sony A7R adopts the same sensor with a near identical capability as the D800, and in a much smaller, lighter weight body. The Nikon D800 also has quite a substantial +1 1/3 stop wider dynamic range at base ISO and although falling rapidly the D800 continues to lead to ISO 400. 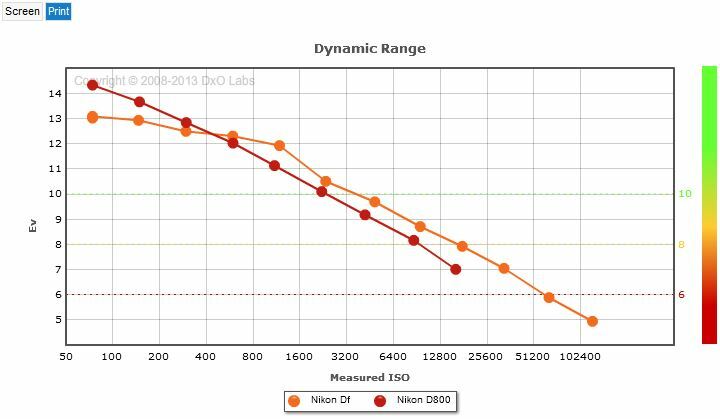 However, from ISO 800 onwards the Df has around a +1/2 stop advantage, even though the DR falls sharply at ISO3200. That +1/2 stop advantage reinforces the Df’s low light capabilities, against the D800 at least, though with other models maybe not so much. At $2750 the Df is competing with the Canon EOS 5D Mk III, a camera with a higher specification, particularly with regard the AF system and a sensor with 22-Mpix. 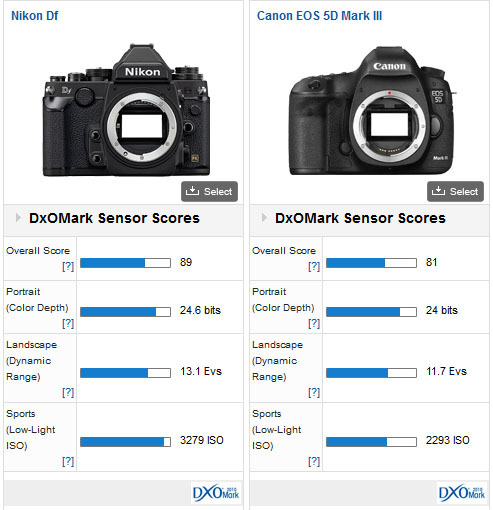 The difference in DxOMark score between the two models reveals the Df has around a +2/3 of stop improvement in IQ overall at base ISO (ISO 100). The Nikon has around +1/3 stop better color to begin with and this difference only improves with higher sensitivities, to around +1 stop from ISO 800 onwards. 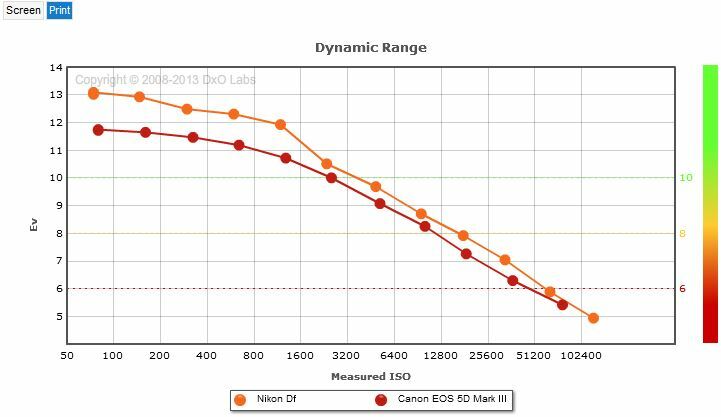 At base ISO, DR is wider by 1.5 Evs and the Nikon has around a ½ stop advantage in ISO over the Canon. The Nikon Df sensor has a very good dynamic range, especially between ISO 100 to ISO 800 where it drops only 1 Ev to 12 Evs, which is still wider than the Canon at base. However, at ISO 1600 the DR narrows considerably but the Df still has a round a +1/2 stop advantage over the EOS 5D Mk III. Although the Canon has several advantages over the Nikon (including a superior AF system, arguably superior handling and a higher resolution sensor, not to mention the video capabilities) the Df is serious challenger, especially if low light capability is important. Nikon certainly threw a curve ball with the Df. On the one hand it has the first-rate sensor of the D4 in a much more compact and lighter weight body, but the choice of retro controls appears to be a step backwards. They make sense with older manual focus lenses, with their manual aperture rings, providing they can be focused accurately but models like the F100 and F6 are proven over those earlier models when used with autofocus lenses, and that includes the current G-series (which lack aperture rings). 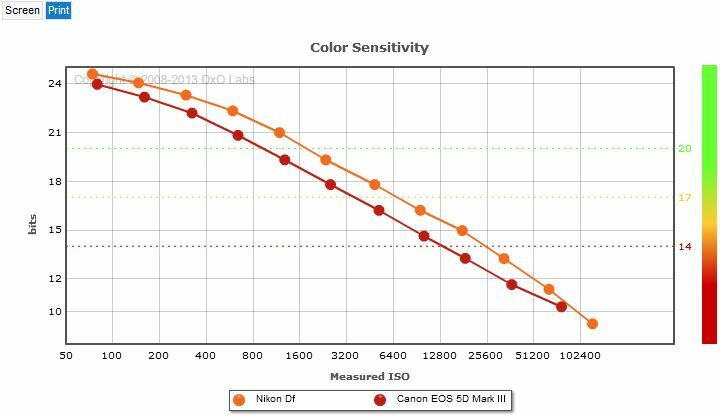 As it stands, Nikon may find the Df sidelined by both the D800, and the D600, which is a pity as the sensor is a superb performer in low light.